Are you looking for the perfect bed for your child’s room? IKEA’s Flaxa bed frame might be just what you are looking for, especially since it has the slatted bed base and storage compartments included in the price. Deals like this one are difficult to find at IKEA, let alone in the whole furnishings market. Therefore, looking into this bed frame option is highly recommended, if you need a functional, comfortable and above all affordable bedding solution. Without further ado, here is a detailed review of IKEA’s Flaxa bed frame! This children’s bed frame comes with the Luroy slatted bed base and the storage compartment included in the price, which is a great advantage. Materials used to make this bed frame include ABS plastic, paper, particleboard, fiberboard and acrylic paint, while the slatted bed base consists of beech veneer, birch veneer, and adhesive resin as a coating. The ribbon on the base is made of 100% polyester and 100$ coating. The mattress you need to complete this bed is sold separately. IKEA has not stated whether the bed frame has adjustable sides or not, but judging by the storage compartments, it most likely does not have that feature. Therefore, before purchasing a mattress, make sure to contact IKEA or visit the store and see the bed frame for yourself. Usually, IKEA recommends a list of products that are a good match with the particular item you are viewing. For the Flaxa bed frame, they have recommended only one coordinating product and that is the matching Flaxa headboard with a storage compartment. This convenient headboard can be mounted from both right or left side of the bed. It has a larger shelf above the pillows and a few smaller storage compartments and shelves on the side. The Flaxa headboard goes for the price of 119$ which is slightly less expensive than the frame itself. The Flaxa bed frame also has two large storage drawers that can fit plenty of extra storage you might have. The bed can be used with or without the storage compartment headboard. Either way, it is functional and looks nice. There are no mattress recommendations for this bed frame, as IKEA usually does include at least one if not two mattress choices. However, to find a mattress that suits your needs, you can go through our IKEA mattress reviews to find out more about every product. The Flaxa bed frame is a highly convenient bedding solution for kids, especially if they have a small room without much space for storage. With this bed frame, you will be able to fit plenty of storage in the drawer department while also having the option of storing items on the headboard, if you decide to purchase it. We will have to rely on the information IKEA has provided and make conclusions out of that. With what we do know, this bed frame is a convenient solution for a kid’s room, and it is an overall good deal, considering all the features it offers. This bed frame is available in twin size only, as that is the size mostly used for kids’ rooms. 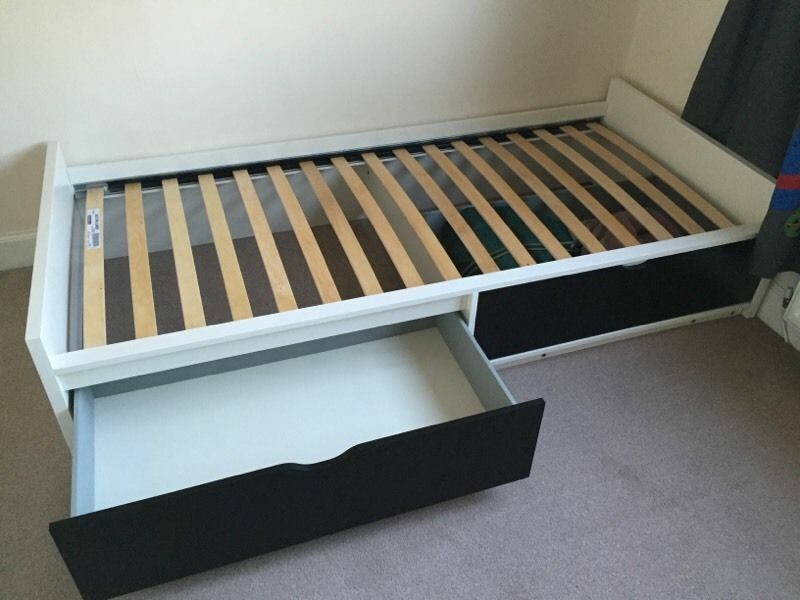 The product is a great offer, considering that the slatted bed base is included, as well as the storage drawers. Most IKEA’s bed frames do not have the bed base and storage boxes included in the price, which makes the Flaxa bed frame stand out regarding what you get for your money. The product requires assembly, which shouldn’t be too difficult if you follow the instructions carefully. As far as taking care of it goes, wiping it clean with a cloth and some detergent will do the job. The Flaxa bed frame comes in 2 packages, which makes it easy to transport without having to pay for the shipping service. As usual with IKEA’s bed frames and most bedding products, the warranty is a 25 years one and covers all manufacturing defaults. Any damage done by the user will not be covered by the warranty. There is no trial period for the bed frame. However, you will have a one year trial period for any mattress you purchase at IKEA. Is IKEA Flaxa Bed Frame Good? Overall, this IKEA bed frame is worth checking out at one of their stores. Once you take a look yourself, you will be able to decide whether it is a good option for you or not.